This weekend I went to the Farmers Market and I bought way too many blueberries. I normally like to eat them as a snack or add into my yogurt, but I realized, holy crappers how am I going to use all of them? Yes, I could freeze them, but instead, I thought why not make a recipe with them? 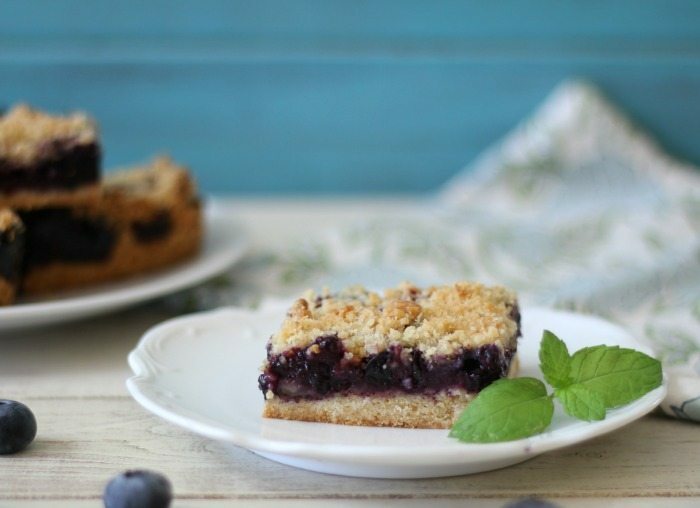 So today I tried my hands at making Blueberry Crumble Bars. These bars exceeded my expectation. 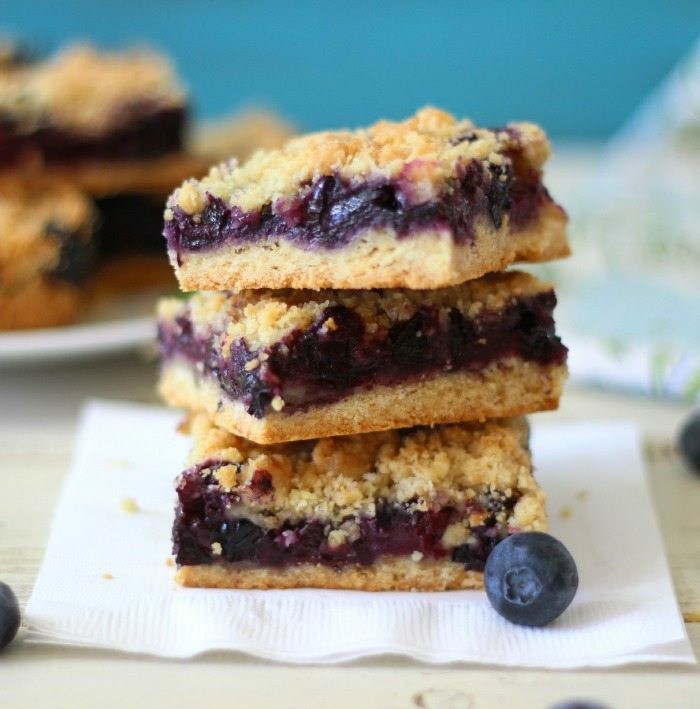 They are lightly sweetened, with big blueberry flavor. Plus the topping, oh boy do I love the topping. These bars are so good, and one is the perfect amount. I have to admit they are on the heavy side weight wise, but big in flavor!! Making the bars is super easy too! I made the crumble topping and added half to the bottom of my pan. 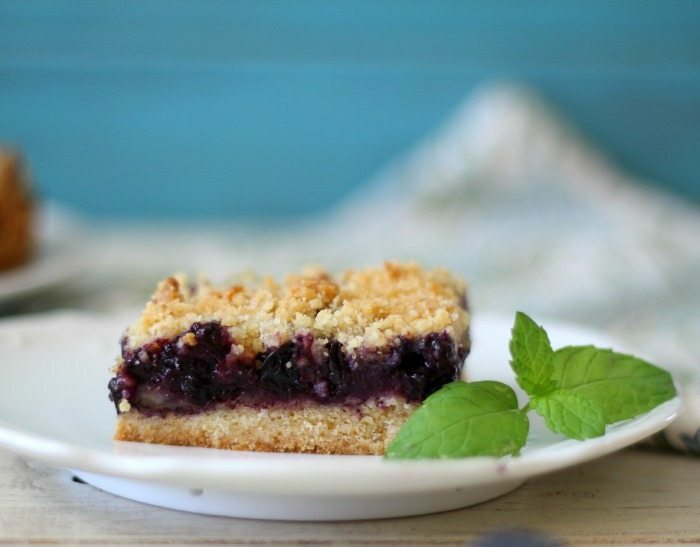 Topped it with a blueberry, sugar and cornstarch mixture and added the remaining crumble to the top. Baked it for 45 minutes and it was done. Let me tell you, the smell of them baking is wonderful. The hardest part was waiting for the pan to cool. I couldn’t wait to dig in. This recipe would also be amazing with other kinds of fruit, which I am sure I will be trying and sharing with you too. 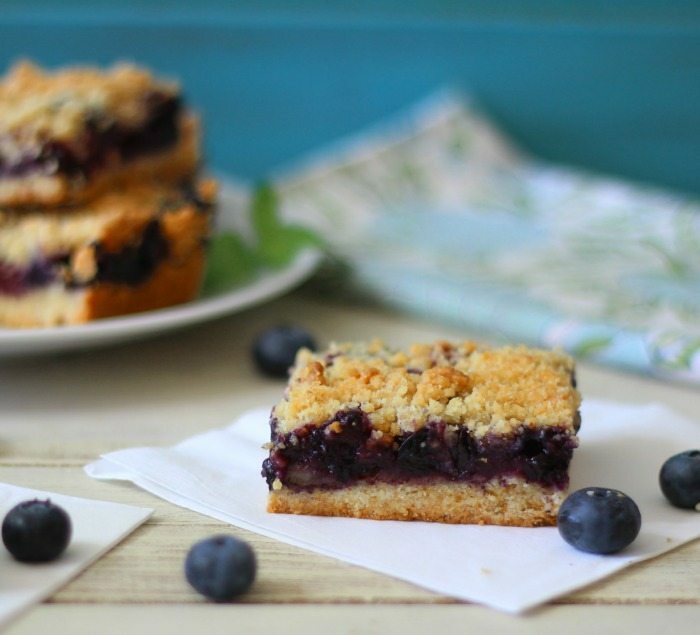 I love simple recipe like this and I am loving the blueberries. Blueberries taste so amazing this time of year. When you buy them during off-season, I find they have no flavor at all. So if you can, go out and get some blueberries now and savor the taste of summer. 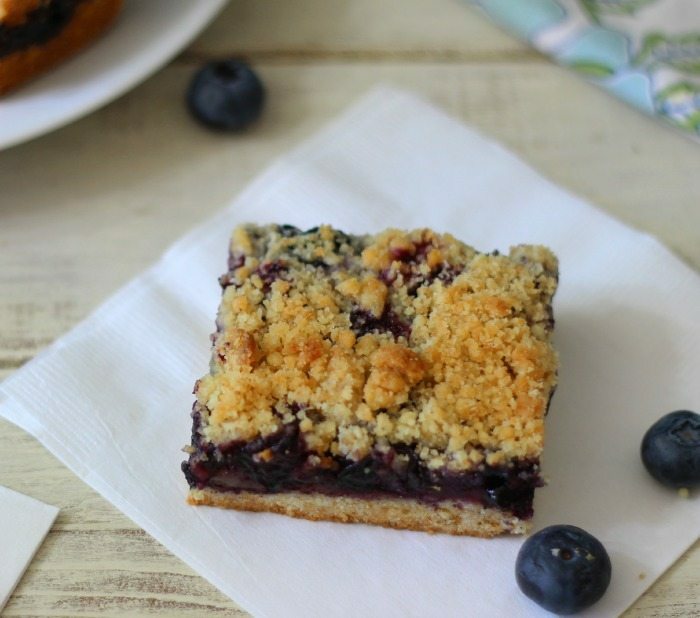 A lightly sweetened bar made with plump, juicy blueberries with a butter, flour and sugar crumble with a hint of lemon. Lightly spray a 9x13-inch baking pan with cooking spray; set aside. In a medium bowl, combine ½ cup granulated sugar, brown sugar, baking powder and flour. Using a pastry cutter, or tow forks (I used my hands); cut in butter. Add egg and lemon extract and mix until well combined and resembles coarse crumbs. Take half of the mixture and press into the bottom of the prepared pan. In a separate bowl, combine blueberries, ½ cup granulated sugar and cornstarch. Stir gently. Add the blueberry mixture evenly over the crust. 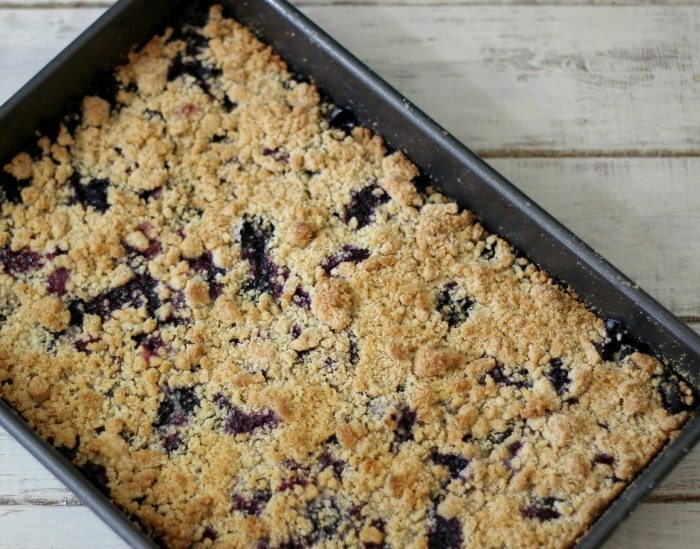 Crumble the remaining dough over the top of the blueberries. Bake for 45 minutes or until the top is lightly browned. Remove from oven and allow to cool completely before cutting. I kind of went crazy on the fruit buying this weekend! Be prepared for more fruity, delicious recipes.